Ontdek de ongelooflijke Rainbow Mountain tijdens deze hele dag wandelen vanuit Cusco. 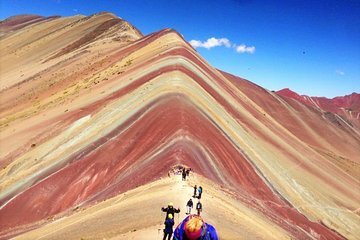 De wandeling naar Vinicunca duurt ongeveer drie uur en bereikt hoogtes tussen 4.700 en 5.200 meter. Geniet onderweg van het prachtige landschap en de omliggende Ausangate-bergen en turkooisblauwe meren. Geniet van een heerlijke lunch aan de top voordat je 2,5 uur de berg afdaalt om terug te gaan naar Cusco. Our tour was on 14/11/17. It was positive that the tour operator managed to get us to and from Rainbow Mountain. However, the tour was terribly disorganized. The bus was over half an hour late picking us up in the morning, with no explanation why. The guide helping the driver seemed confused about where to pick up the rest of the tour group and how to find their locations. After about 45minutes of driving around trying to find the rest of the group, we picked up the guide. The guide seemed to jump off of the tour bus every 45 minutes on the drive to Rainbow Mountain, and he seemed to be asking for directions. We reached breakfast at a local's house, where the food was nice and well-prepared. This part was well-organized. Then we continued on to Rainbow Mountain. Again, the guide did not seem to be aware of where we could stop for bathroom breaks and seemed to be asking locals for directions regularly. We arrived at Rainbow Mountain approximately 12:30pm. Most other tour groups seemed to be coming back down. Our guide did not give us any history of the mountain or area, he just seemed to walk with us. He only had a small backpack, so I'm not sure if he had emergency oxygen or not considering how many of our group were affected by the altitude at 5100m above sea level, I would have thought he would have let us know. We returned back to the tour bus approximately 2:30-3pm, where we were certainly the last group there. By this point a hail storm had started and light snow was covering the ground. We arrived to lunch around 4:30pm at the same local's house - again, this was beautifully cooked and well-prepared. We finally arrived back in Cusco at approximately 8:30pm at night - well after the anticipated 4-5pm return time. The bus successfully got us to and from Rainbow Mountain, and the breakfast and lunch were great, however considering the lack of organization by the guides, I'm not sure it was a tour. The lack of knowledge the company seemed to have about travel time and their lateness made me think they had not done this tour many times before. This could be wrong, but based on the guide asking for directions and the gross underestimation of travel time, it didn't come across like they were familiar with the trip. Buyers beware—this “tour” is complete garbage! They will not pick you up at your hotel and the guide will not be present at all along the trail. Furthermore, don’t bother specifying a language as you’ll get whatever’s available. The transportation won’t be climate controlled either. Loved it. I didn't realize the toll my body would take due to the altitude. When we arrived the guide did not have our tickets immediately available to enter however the group reimbursed us the cost and met us at our hotel. We paid 50 more for this excursion and we met with other couple who took the other excursion and basically comparing both.. it was the same, We had a 5 breakfast and a 8 lunch.. if much. We feel cheated for what we paid..
Our guide was very friendly and informative. Picked up from my hotel on time, took a nap in the van and had breakfast before the hike with a local family- food was delicious! The hike was everything they said it would be, 9 challenging miles, bring water, snacks and rent a trekking pole from the locals s/5. The elevation will hit you, no matter how great of shape your in but, keep moving, pace yourself and enjoy the view at the top : worse case, rent a horse at the bottom and ride up! Also had a late lunch with the same local family upon our return before our return to Cusco - great expenicence- great trip. It was an amazing experience, the tour guide explained very well the options everybody had, walking or getting up by horse. Everybody needs to be aware, for walking up all the way you need to be in good physical condition, it is in high altitude. A great experience to people that love walk and mountains. You shoud to be prepare to walk and up very high, but the final vision is a conquest!